There are a lot of WordPress slider plugins to choose between. We had one that we really liked, one we have used with clients and students for many years but suddenly it is gone! The developers of Portfolio Slideshow Pro have closed their website and their plugin support. This was a surprise and a disappointment. What set The Portfolio Slideshow Pro Plugin apart from so many other slider plugins is that it could change the display of WordPress native galleries into a beautiful slideshow. Many slideshow plugins create their own plugin specific custom post type. A plugin that uses the default native WordPress gallery shortcode provides a safe fallback option. We like that. For example, one particular client had a lot of image galleries displaying his portfolio of work on his website. When he lost the Portfolio Slideshow Pro Plugin he didn’t have to start over from scratch. Because his site used default WordPress galleries we could deactivate and delete the deprecated Portfolio Slideshow Pro Plugin. His galleries simply reverted to the native WordPress galleries — displaying something is better than nothing! We could activate the Slideshow function in Jetpack to quickly change the native gallery display into a slideshow. This was a good stop-gap measure but let’s face it, the Jetpack slideshow isn’t very attractive or versatile. Over the past month we have tested a number of popular WordPress slider plugins to find a replacement. We were really pleased (and relieved) to find that the Soliloquy Slider has an available addon that will override the default WordPress gallery output with a slider. The Dynamic Addon will override the WordPress gallery shortcode output and turn it into a slider with some custom attributes. We didn’t need to recreate all of our galleries! But we did need to edit all instances the gallery shortcode and add the attribute soliloquy=”true” to turn it into a slider (make sure the quotes are straight quotes not curly). To add thumbnails you will need to also activate the Thumbnail Addon. The free version of Soliloquy just isn’t going to cut it. You will want to purchase the premium plugin and make sure that you choose a license that includes the Advanced Addons. 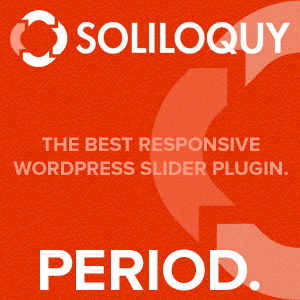 Click the image below (includes an affiliate link) to get started with Soliloquy. If you don’t see the image, please pause your browser ad blocker. If you only have a few galleries you won’t necessarily see our point but if you have a site filled with galleries that you don’t want to have to recreate you’ll agree. This experience confirmed what we already felt, that using the native WordPress gallery shortcode is better than using a plugin’s custom post type. Disclosure: This page contains external affiliate links that may result in us receiving a commission if you choose to purchase said product. The opinions on this page are our own. We do not receive payment for positive reviews. The workshop took me, a complete novice, to the point where I consider that it will now be possible for me to build and administer my own website. This workshop was extremely beneficial. Well worth it for anyone who has or in thinking of having a website. Ruth and Dawn are great and super helpful. I recently attended Ruth & Dawn’s WordPress workshop. Even though I was completely new to WordPress, I understood all the information and concepts I needed to build the website I wanted. They both have great knowledge and experience. I definitely recommend this workshop to anyone who wants to learn how to build their own website, as well as be able to manage and update their content.